Welcome to our 2018 Spring issue! 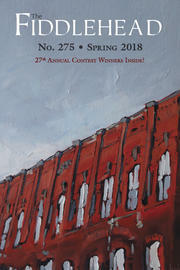 Read the winning poems and excerpts from the winning stories from our 27th annual literary contest. And as editor Ross Leckie puts it: "Pick up the gorgeous spring issue and you can bend its soft pages this way and that, pulling an early spring toward you or stretching the snowy pages toward May flowers." Join Fredericton’s Cultural Laureate, Ian LeTourneau, as he leads a panel of three local poets —Triny Finlay, M. Travis Lane, and Ross Leckie — with readings and discussion at the Fredericton Public Library on Thursday, April 26 from 7 – 8:30pm in the River Reading Room. Triny Finlay is the author of two collections of poetry, Spitting Off (2004) and Histories Haunt Us (2010), both published by Nightwood Editions. Her most recent publication is the forthcoming chapbook, You Don’t Want What I’ve Got. The penultimate Odd Sunday of the season takes place April 15, 2018 at Corked Wine Bar, 83 Regent St. at 2 pm. The two featured readers this time are Bren Simmers and Catherine Owen.